Home > Law Books > Treatises > Representing the Bankrupt Taxpayer, 2018 ed. Representing the Bankrupt Taxpayer, 2018 ed. 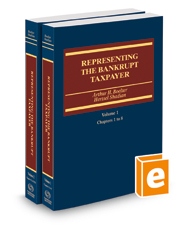 The text also provides examples, strategies, and IRS procedures, as well as complete passages from the Internal Revenue Manual.